As my soon-to-be college freshman daughter and I snaked through the aisles of Staples, we dodged mothers carrying red baskets overflowing with pens, pencils, notebooks, and binders and children running every which way, looking for just the right folder or book cover. I remembered all those years of outfitting three children with school supplies and breathed a sigh of thanks that, college tuition notwithstanding, our days of buying stock in Mead or 3M were pretty much over. And it was true. We arrived each September at Charlestown Elementary School to find our desks equipped with a new set of fat Crayola crayons (purple, blue, black, green, white, brown, orange, yellow and red). On open shelves at the side of the room were piles of any kind of paper we might need: small off-white rectangles for our times tables and math tests; larger, yellow, lined paper for practicing cursive; white lined paper for final drafts and special occasions – such as writing to Santa or a favorite author. Our books, of course, were provided, and they were in surprisingly good shape, although many were probably ten years old. Ours was not a particularly prosperous school district, but it was assumed that the school would supply each child with the tools and books needed to learn. It was also expected that we would take care of the books loaned to us and use the supplies – the rulers, pencils, and paper – with care. Certainly, parents still had to outfit their children with clothes and lunchboxes, but there was no mad trip to an office supply store every September. For one thing, stores like Staples, Office Depot and Office Max did not exist. When I entered junior high school I bought my notebooks and pens at a small department store in a nearby town; no one stocked up on folders, Post-It Notes, or colored index cards, because these supplies either hadn’t been invented or were not in wide circulation. We didn’t buy stretchable book covers; we cut out book covers from paper grocery bags. We didn’t have calculators (certainly not the $120 graphing calculator our local high school requires); we bought slide rules and protractors. And it goes without saying that the home computer and all the electronic gadgetry it has spawned – the flash drives and printer cartridges and chargers – would have been considered science fiction back when I was in school. A few thoughts come to mind, as I ponder the industry that has sprung up around back-to-school. One is that schools should supply all elementary school children with paper, pens or pencils, and any other supplies they need to learn. I don’t want to hear about budget cuts and tough times and whatnot. If our tiny elementary school in Rhode Island had enough money to buy these things in the 1960s and 1970s, we should be able to do it today. If we can’t, we’re spending our money in the wrong places. Another thought is that we have lost sight of what is a “need” and what is a “want” for our students. 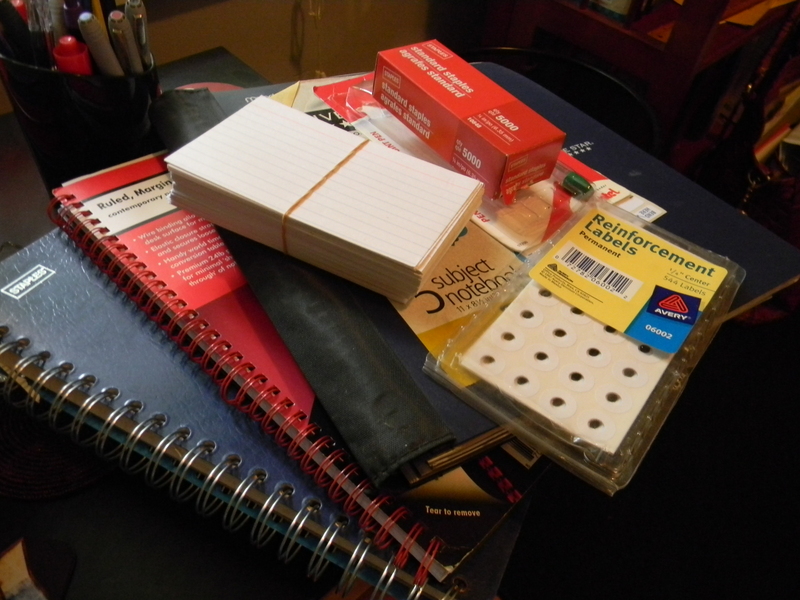 Students need writing paper, writing implements, and books. They don’t need folders, special book covers, Post-It Notes, elaborate binders, or printer paper. If they need computers, tablets, etc., those devices should be available during school hours; parents shouldn’t have to purchase them. When all three of my children were in public schools, I routinely spent more than $100 every year – sometimes more – on materials required by teachers but not supplied by school districts. Today, the bill is probably higher. Yes, school systems benefit by not having to purchase these items (and they funnel money somewhere else instead) and corporations profit handsomely from this state of affairs. But that doesn’t make it right, and parents, taxpayers, and school officials need to do something about it. We all love new notebooks, but parents are getting soaked every September.